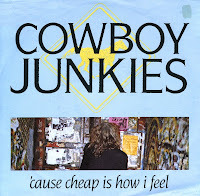 The Canadian band Cowboy Junkies were formed in 1985 by Michael, Margo and Peter Timmins with Alan Anton. They have always been popular in Canada, but were unable to gain popularity in other territories. I heard about the band when I hung out with some friends in the early nineties who were very into alternative music. Artists like Tori Amos, Happy Rhodes, Sarah McLachlan, Cocteau Twins and the like filled the room when we were together. I picked up this single because I liked the song a lot, but I never pursued the band any further.